P.E.A.R. 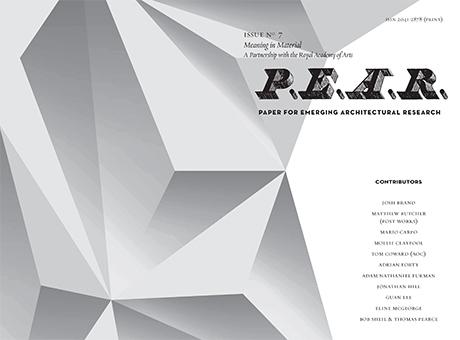 (Paper for Emerging Architectural Research) has launched its seventh issue: Meaning in Material. This issue, edited by Bartlett Lecturer Matthew Butcher and developed in collaboration with the Royal Academy of Arts, focuses on how materials give architecture its form and substance, with both conceptual and experiential implications. Other contributors to the issue from The Bartlett include Prof. Mario Carpo, Mollie Claypool, Prof. Adrian Forty, Prof. Jonathan Hill, Dr. Guan Lee and Prof. Bob Sheil and Thomas Pearce. P.E.A.R. (Paper for Emerging Architectural Research) is published twice a year and is sold in over 40 countries worldwide. In London, it is stocked in bookshops including Foyles on Charing Cross Road, Artwords Bookshop on Rivington Street, the AA Bookshop, RIBA Bookshop and Walther Koenig Books at the Serpentine. The paper is also distributed internationally and can be found at Walther Koenig Books and PRO qm in Berlin, Tema in Lisbon and Museum of Modern Art in New York. It is also available in Taipai, Melbourne, Istanbul and Auckland. The paper was also featured in the current travelling exhibition titled 'Archizines' which was curated by Elias Redstone and which toured venues including Storefront in New York and the AA in London. P.E.A.R. was founded by Rashid Ali, Matthew Butcher, Julian Krueger and Megan O’Shea. It is designed by Avni Patel. For more details, and a full list of stockists, please visit the P.E.A.R website or email info@pearmagazine.eu.